Fancy trying out a driverless vehicle for yourself? Now you can; if you reside in London, that is. Last Friday, the Transport Research Laboratory (TRL) invited the public to sign up for the first public trial of a self-driving vehicle in the UK. The pilot trial will take place in the borough of Greenwich, which has been designated in its entirety as a Smart Mobility Living Lab. The objective of the test is to ascertain how the public would react to driverless vehicles when they are let loose in a city environment, where there are plenty of motorists and pedestrians. We are hardly Luddites, but if we were in Greenwich during the trial, we would be on constant alert and ready to jump aside whenever one of these pods comes our way; teething problems in new technologies are hardly uncommon after all. The driverless vehicles that will be used in the project are not cars per se. If you have ever been to London’s Heathrow Airport, you might have ridden in one of these pods, which are already in commission in one of the world’s busiest airport, where the electric four-wheelers shuttle travellers around quite efficiently and safely, but on tracks. The Ultra Pods have to be repurposed to make them road-ready for the trial, and TRL has sought the expertise of an experienced car builder, Westfield Sportscars, and a research-based robotics company sprung from Oxford University, Oxbotica (portmanteau of ‘Oxford’ and ‘robotics’, geddit?). The trial routes have yet to be determined but will focus on places where the fully automated vehicles will encounter plenty of pedestrian and bicycle traffic; if you are either of these two, it would be wise to be on the lookout for wayward vehicles when the trials begin sometime later this year. Each vehicle will have to first be driven around by a human, so that it can map the route in 3D; following that, the pod will use an array of built-in lasers, cameras and sensors to determine its own location and detect hazards and, well, people. It’s not exactly the vision we have of hopping into a driverless car and commanding it to get us to any destination that we desire, but it is certainly a start. And if you are lucky enough to be chosen to participate in the trial, you will be required to give them feedback on your experience – possibly in the form of recorded interviews, so make sure you’re ready for your close-up and tidy up after you had indulged in misbehaviour during the ride. 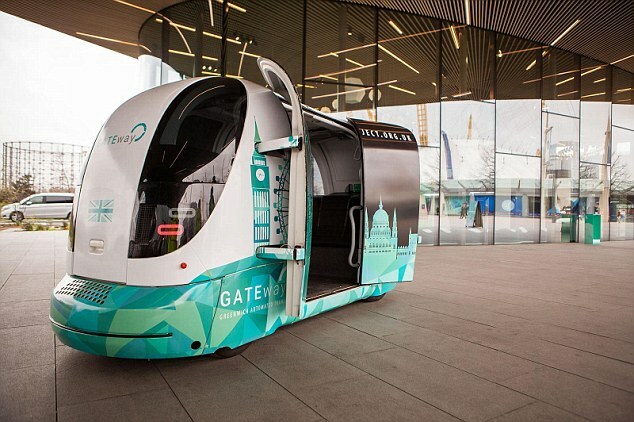 Nick Reed, the Director of TRL, said that this trial would give the public the opportunity to try out an automated vehicle and “make up their own mind as to how much they like it, trust it and could accept it as a service in the city”. The trial is only part of a larger GATEway project that the UK government is funding with £8 million. Earlier, the government had promised that driverless vehicles would be allowed on motorways in the UK by 2020, so it seems that they on schedule. Early next year, Volvo will be embarking on a programme to ferry 100 families around London in driverless cars. Meanwhile, across the pond, Google has been making headway with its own self-driving car technology, but the company has met a roadblock (pun intended) in testing on public roads, with authorities concerned about public safety and requiring the cars to be outfitted with steering capability and a human driver on standby behind the wheel at all times. Maybe, with the UK seemingly more open to driverless vehicle testing and less concerned about the safety of its citizens on the road, Google might be enticed to move its research to where it would be less constrained.